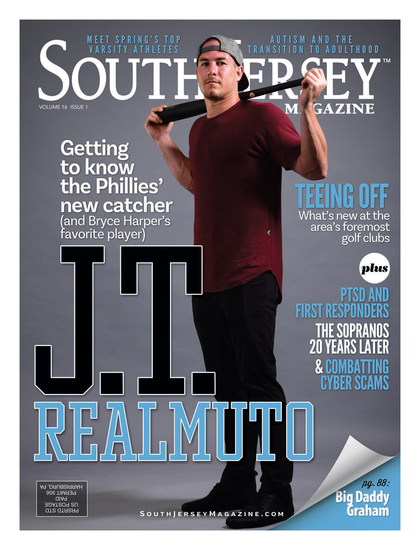 Each year, you anxiously await our July issue to see who we’ll unveil as the year’s Best of the Best in South Jersey. Putting together this list is no easy task, but that’s why we take so much pride in doing it. We spend the entire year traveling throughout South Jersey’s landscape to find the meals, services, shops and more that are deserving of high praise. And we upped the ante on this year’s installment by introducing several new categories, so read on to see who’s serving up the best ice cream, where to sip amazing cocktails, find the perfect place to get outfitted for a night on the town, and much, much more including readers’ choices. Washington Township’s Slice is more than just your average suburban pizza joint thanks to a menu full of model-thin pies fashionably dressed with everything from sautéed clams to San Marzano tomato sauce. Our favorite? The decidedly delectable offering topped with mozzarella, caramelized onions and ribeye steak; finished with white truffle oil. At Deluxe Italian Bakery in Runnemede, they take their cream donuts seriously. Here, the powdered pockets aren’t simply filled, instead they are sliced open and piped full of your choice of vanilla, chocolate or strawberry cream. Whether you’re indulging for breakfast or treating yourself to a late-night snack—or both—there’s nothing quite like them. Abbruzzi and Giuanta’s in Mount Laurel is South Jersey’s answer to Philly’s Italian Market, with an array of cheeses, antipasto, homemade prepared foods and much more. It’s also where you’ll get the area’s best hoagies. Nothing fancy here, just authentic, well-constructed sandwiches that require repeat visits. Over at Crazy Susan’s Cookies in Voorhees, the longtime Ocean City landmark run by Camden County native Susan Adai, has found a home—not to mention a sizable kitchen—to create their exceptional assortment like mint chocolate chip, oatmeal cherry coconut, cranberry white chocolate and more than two dozen others. You can never go wrong with the Crazy Turtle – a chocolate chip and cashew cookie topped with both a layer of caramel and Belgian milk chocolate. Seasons 52’s dining room is warm and inviting, but arriving a little ahead of your reservation will allow you to take advantage of the custom creations being served at the bar. Seasonal sips like the strawberry basil fusion—strawberry-infused vodka with fresh basil and agave nectar—vary, but even the basics (think margarita) get a boost (think Patrón). At The Apron in Haddonfield, the middle of the week is reserved for one of their most popular dishes—the pot pie. These oversized specialties are heavily loaded with chunks of chicken, potatoes, peas, carrots and plenty more and the flaky, buttery puff pastry is worthy of its own attention. If you couldn’t tell these were made with love, the raised heart on the crust tells you all you need to know. Ordering wings used to mean choosing between buffalo, teriyaki or barbecue. Well, these days, places are coating their chicken in more imaginative sauces and glazes, and none do it better than Swedesboro’s Village Pub. These plump crowd pleasers come conventionally, but we can’t get enough of their more unique styles like the chipotle bleu, spicy ranch and our current go-to, spicy creamy parmesan. From fast food joints to fine dining restaurants, there are a lot of burgers being slid between two buns out there, but they pale in comparison to Blue Monkey Tavern’s signature angus patty topped with portobellas, caramelized onions and crumbles of creamy blue cheese. It’s tender, juicy and full of flavor—one bite and you’ll never limit yourself to choosing between American or cheddar ever again. We’ll admit the name threw us at first, but Let’s Yo! should be judged on one thing and one thing alone: the frozen yogurt they serve. From birthday cake (everything but the candles) to tropical fruit (with real fruit pureed into the yogurt), the self-serve flavors being pumped into bowls and waffle cones here are anything but ordinary. We love cheesesteaks and chicken cutlets just as much as anybody, but sometimes we want a sandwich that won’t slide us into an immediate food coma. That’s when we turn to Jake’s on the Bypass for their piquant salmon filet on a Liscio’s roll (make sure it’s seeded); topped with spinach, bruschetta and a sour cream dill sauce made in-house. With 20 rotating taps and a bottle list that reads like an encyclopedic entry, The PourHouse is a craft beer lovers dream home, where hop-filled IPAs and well-balanced Belgians share the real estate. Whether you’re using the suggestive pairings on their menu or just out to try a limited edition brew, even the most discriminatory drinker can quench their thirst. Ever wonder what beer is supposed to taste like? Order whatever’s on the firkin and savor the cask-conditioned ale. When Chef Nunzio Patruno took home our Top Chef honors a few years back, many readers wished they could prepare such skillful meals. Thankfully, Patruno is willing to share a few of his secrets during his “Cooking with Nunzio” series at his namesake Italian BYOB in Collingswood. Whether you’re picking fresh ingredients from the farmers market or making your own pasta, Patruno will improve both your culinary knowledge and technique in a way that’s less Hell’s Kitchen and more heaven on earth. Long before a certain chain flooded the area, we were regulars at South Jersey Soft Pretzel in Stratford. Guess what? We still are. These doughy delights, which come in shapes that vary from traditional twists and braids to party-pleasing options like Christmas trees and Valentine’s hearts, are perfectly browned and highly addictive with or without the Keller’s mustard. Daddy-O’s is a Marlton institution where throngs of South Jerseyans regularly line up for a taste of homemade ice cream in oh-so-not-vanilla flavors like cotton candy and apple pie. Not sure if you’re ready for banana cream pie? Don’t worry, you’ll find plenty of other excellent choices. Christine McHale, better known in Moorestown as The Pie Lady, is always invited to our house for dinner as long as she brings her mouthwatering Key lime pie. Or her coconut cream. Or her apple crumb. Is it too early to start placing orders for Thanksgiving? For more than 75 years, Leo’s Ice Cream Company in Medford has been making their own version of water ice, dubbed Yum Yum, in notable concoctions such as honeydew and cherry-pineapple. Come summer, we love the creamy texture and array of fruity flavors that become more memorable with each spoonful. When we have a craving for chocolate, there’s only one place to turn and that’s Duffy’s Delicious Candies, a family-run business that dates back more than eight decades and features inherited recipes that date back to the early ‘20s. Here, everything from Oreos to figs are covered in milk and dark chocolate, but they also make cotton candy, gummi bears, licorice and other assorted items. Over at Sammy Chon’s K-Town BBQ in Cherry Hill, they know a thing or two about Korean barbecue. You may also be surprised to learn they know about quality sandwiches, too. Witness the koagie: your choice of steak, chicken, pork or even fish on a bed of sesame coleslaw and topped with a pile of kimchi. If only all Asian fusion cooking was this successful. Marlton’s Pho Xinh, the latest location in a dynasty of Vietnamese restaurants across South Jersey, transcends the typical takeout found in a shopping complex. But we recommend you take the whole lunch hour here and dip a porcelain soup spoon into their namesake noodle soup, an ocean of deeply flavorful broth filled with gossamer rice noodles and paper-thin strips of tender brisket, layered with crisp bean sprouts, scallions, onions and sweet Thai basil. Don’t forget to embellish with hoisin and sriracha sauces to kick things up. It may be summertime, but that doesn’t mean soup should be off your radar. Tucked into a shopping center in Marlton, Ragazzi Restaurant is an unassuming casual spot making upscale restaurant quality bowls of homemade soup. The chicken pastina is thankfully always available, while daily selections like Italian wedding or cream of chicken rotate in and out. With only two offerings, some may scoff, but here it’s definitely about quality, not quantity. We love to hit up Croce Pasta Products in Cherry Hill around lunch time to scoop up one of their killer strombolis. Chunks of pepperoni or sausage are generously distributed throughout the pocket of crusty dough the size of a well-developed forearm. They only make so many, so get there early to get one hot and fresh, right out of the oven. Everyone loves a good french fry, but sometimes you come across something that sounds too good to be true. At Ponzio’s Diner, they cut eggplant into strips and batter them in breadcrumbs for a crispy alternative, then serve them with a light, refreshing tzatziki sauce. Come holiday time, you have to get up pretty early if you want to snag some bread from Cacia’s Bakery, the fourth-generation family business that only shuts down its ovens twice a year. Whether you are looking for seeded or unseeded, French or Italian, dinner roll or hoagie roll, Cacia’s is the name South Jersey has trusted for decades. Anyone can walk into the supermarket and pick up some generic olive oil, but at Taste of Olive, you can actually taste the subtle nuances of varieties that span the globe from Italy to Australia. Oils and vinegars are on tap, giving you the chance to sample the goods before bottling up your own blend. You’ll also find honey, specialty salts, various mustards and other gourmet items that will make you the guest of honor. With more than 160 wines offered by the glass, Annata Wine Bar has no shortage of options to pair with their menu of Italian-influenced tapas dishes. But, we love the fact that they don’t make wine feel like an exclusive club for snobbery. A combination of familiar and obscure vintages make the wine list here both approachable and credible, and we’ll raise a glass to that. When given the choice, we always opt for fresh pasta; it just tastes so much better and it’s really not hard to make. However, the trick is being able to make it well and that’s where someone like Chef Mark Berenato of Haddonfield’s Da Soli comes in. From his snappy “guitar” string pasta to the delicate ricotta-filled gnudi, Berenato has mastered the art of creating amazing fresh pasta that even carb counters should be embracing. When Zeppoli opened its doors in Collingswood, it generated a lot of buzz, mainly because of Chef Joseph Baldino’s pedigree, which includes stints in Italy as well as Philly’s famed Vetri Ristorante. As it turned out, the hype was more than justified as Baldino’s succinct Sicilian-inspired menu wowed diners, including one of our food critics who awarded the 35-seat shoebox-sized eatery 5 Forks, our highest culinary rating. The food is simple in nature, complex in preparation and exquisite in taste, resulting in not only the best new restaurant in South Jersey, but one of the best restaurants anywhere. Nobody likes talking shop on an empty stomach, which is why when it comes to a successful business lunch, the key is to plan ahead. Concentrating on your talking points is one thing, but pick the wrong restaurant, and you might as well just sit down and ask for the check. Luckily, at Caffe Aldo Lamberti, sealing the deal is made easier with its sophisticated dining space and a menu full of ultra-fresh seafood, entrée salads and rich pasta dishes. Your client will be thankful you didn’t invite them to another tired steakhouse and, if all goes according to plan, you’ll both be celebrating at the bar. Braddock’s bills itself as “casual gourmet dining,” meaning the atmosphere is laid back, but the food isn’t lazy. Impressive appetizers, from tartar to terrine, are just one way to satisfy your midday appetite. Want pork belly on that salad? No problem. Can’t decide between chicken or fish? Get both on the chicken Oscar. If you’re celebrating, make sure to order the soufflé well ahead of time. There are lunch buffets and then there is Monsoon’s lunch buffet. Try not to fill up on the naan so that you can chow down on other traditional Indian favorites like tikka, vegetable samosa and biryani, which are cooked in abundance, allowing diners to indulge in a lavish ethnic feast. And don’t worry if your work schedule doesn’t allow for a sit-down lunch; the buffet is available for weekend warriors, too. After a tough day in the office, there’s nothing better than a stiff drink and a quick bite to eat, but the days of wings and cheap swill for happy hour are over. These days, we head to RiverWinds in West Deptford for a blood orange martini or one of the dozens of wines available. Even the noshes are elevated—think vodka penne with lump crab or steamed PEI mussels with chorizo—and are just $6 before 7 p.m.
Not far from the Gloucester County Courthouse sits the Woodbury Station Café, a renovated former train station depot where the kitchen is cranking out some truly remarkable food given the small space. Once just a spot for sweet crepes for breakfast and stellar sandwiches for lunch, a newly added dinner service brings accomplished plates like osso bucco and prime rib to the table, and the attentive servers only enhance the overall dining experience. The whole cupcakes everywhere you look is getting a bit old, but that doesn’t mean we should retire them just yet. Krista Walker, the sweet scientist behind Pretty Sweet Bakery in Haddonfield, is known for mixing up tantalizing batches based on your preference or with seasonal ingredients. And there’s no limit to her creativity with selections like peanut butter and jelly and German chocolate cake. When we can’t get a ticket to the game, we head straight to Miller’s N.J. Ale House in Mount Laurel for an ice-cold adult beverage and to find a seat near one of the big-screen televisions. There are 63 HDTVs inside Miller’s, which means no matter how crowded it gets, you’ll always have a good vantage point for all the action. Beer and cocktail specials and a serviceable menu that mixes gameday grub with larger entrees means you’ll have plenty of reasons to cheer long after the buzzer sounds. The Mansion is known for its elegance, so it should come as no surprise that their Sunday brunch buffet gets the white-glove treatment. In addition to the standard breakfast fare, you’ll find cooked-to-order omelets and waffles, a carving station, fresh fish and a variety of gourmet entrees that change frequently. Start with your complimentary mimosa and finish with a selection of indulgent desserts. Keep an eye out for special themed brunches, like the upcoming seafood-inspired event on Sept. 9. Reservations aren’t only recommended, they are required. One thing South Jersey is not known for is solid, stick-to-your-ribs barbecue. Well, Gerald Dougherty changed all that when he opened up Little Louie’s BBQ in Collingswood in 2011. Since then, locals have filled the space for a taste of his brisket, ribs and chicken, which takes inspiration from the barbecue capitals of the country—Memphis, North Carolina, Kansas City and Texas—but you’ll also find tasty specialty items like smoked duck and spaghetti with pulled pork and barbecue sauce. Just because you are eating a salad doesn’t mean it has to be boring (we’re talking to you Caesar), which is what makes Washington Township’s Salad Society such a treat. Steak with blue cheese crumbles, grilled chicken with edamame and mandarin oranges, and grilled salmon with goat cheese, toasted almonds and sundried tomatoes are just a few of the exciting menu options. They also have more than 20 dressings in flavors like cream cucumber dill and hot bacon. Few culinary experiences are as rewarding as the chef’s tasting menu. There’s just something about putting your fate in their capable hands that elevates the evening. At Sapori, this means diners turn to Chef Franco Lombardo for his creativity and deft hand in the kitchen and the result is your choice of a five- or six-course-meal crafted around your likes and dislikes. They’ll be other people in the restaurant, but the attention to detail will make it feel as if you have the place to yourself. Visiting guests feel right at home at Bar 555, located within The Westin in Mount Laurel. Far from a run-of-the-mill hotel watering hole, this sleek space just off the lobby is cosmopolitan in scope and serves up distinctive light bites while the attentive barkeeps make sure your drink is always full. Over at Los Amigos, the Mexican food is unapologetically authentic, which means you’ll find plenty of heat on the menu. From the spicy tequila-braised chicken to the Texarkana burrito, you’ll definitely need a glass of water nearby, but you’ll also taste the rich flavors in every bite. They have several dishes that don’t climb as high on the heat scale, but where’s the fun in that? Arthur Murray offers private lessons and group classes in more than 15 types of dance, from the classy Viennese waltz to the upbeat style of salsa. And the instructors here will make sure you don’t embarrass yourself at your wedding; just bring a recording of your song and you’ll learn all the right moves. Or, bring the entire wedding party for a unique bonding experience. If you’re looking for a family-friendly way to spend New Year’s Eve, First Night Haddonfield is just the ticket. Live music, comedic and theatric performances, events especially for the kids (like the annual teen dance), and food from some of the town’s popular eateries make this a can’t-miss celebration. If you’re bored of the usual venues for corporate events and private parties, try The Wine Room, where the Tuscan setting makes it seem much further away than Cherry Hill. Your guests can not only take part in tastings and get an education in the vino they are sampling, but they can also prepare, bottle and label their own vintage to take home and enjoy. You can pick your own fruit at Johnson’s Corner Farm or you can put the cooking and baking into their more-than-capable hands. Their pies are staples around these parts, especially come holiday time, and don’t get us started on their addictive apple cider donuts. But more than just a farm stand for fruits and veggies, Johnson’s also offers dinners to go and a variety of plants and other gifts to spruce up the home. At Little Sport, when you schedule your child’s birthday party, you get the entire venue. The package includes free play time, coached activities, a birthday ride in the golf cart, and, of course, plenty of cake. It’s very little work for parents, too—the staff will handle everything from setting up to cleaning up. What doesn’t Katz JCC offer? Concerts, swim lessons, field trips, camps, piano lessons and sports leagues? Check. Programming for kids, teens, adults, couples, families and those with special needs? Check. And don’t forget about special events like their annual festival, which draws some big names and even bigger crowds to this community mainstay. Not only does Main Street Cigars sell premium cigars, they offer a public lounge where you can light up with fellow cigar aficionados. But you’ll want to be a member here, as it gains you access to the private lounge complete with leather seating and large screen TVs. You’ll also get your own personal locked humidor and after-hours access as well as invitations to exclusive tasting events and plenty of store discounts. Although there are multiple venues within Lucien’s Manor to choose from, you’ll never be bothered by another party going on—the spotlight is on your event. And your guests will never complain about not getting anything to eat during cocktail hour, where food is in abundance. Come dinner time, guests can choose from three entrees, even ordering seconds if they desire. But make sure to save room for dessert— in addition to wedding cake, the enormous dessert table will have your guests talking for months. With designers like Manolo Blahnik, Jimmy Choo and Alexander McQueen always on hand—or should we say foot?—there is no shortage of high-end, chic styles to choose from at Nordstrom in the Cherry Hill Mall. From stilettos to slingbacks, this is the top spot for any respectable shoe closet. Benjamin Lovell Shoes, one of the many great shopping stops on Haddonfield’s main drag, has just what men need to finish up a great outfit. Here, you’ll find plenty of loafers and oxfords from lines that range from Allen Edmonds to UGG of Australia, and styles that go from backyard barbecue to a night on the town. Cole Hamels and Claude Giroux are just some of the local celebrity clientele who can be seen regularly sporting the latest fashions from Hugo Boss. Luckily, you don’t need to be a star athlete to don the same attractive attire, the tailored fits and modern looks are available to anyone with a modern sense of style. When it comes to really unique retail therapy, the Cherry Hill Mall has it all. Newcomers like The Art of Shaving, Michael Kors and True Religion have upped the mall’s profile, and soon-to-be tenants like The North Face and the famed Henri Bendel will help give King of Prussia a run for its money. The dining options, from casual to classy, mean that once you park the car, it’s going to be hard to leave. Joey’s Unique Boutique in Marlton is overflowing with stylish staples that will turn your evening out into a fashion show. Owner Dana D’Antonio pays attention to her customers and only carries lines that will have them looking their best. We keep coming back for irresistible jeans from 7 For All Mankind and J Brand and absolutely love the tops from the likes of Ella Moss and Sanctuary. We know how hard it can be to find that special dress for a big evening, which is why we put our faith in Marlton’s Primadonna. You’ll stand out in designers like Elm Design and Re.Set; brands that are hard to come by in South Jersey, but make a big statement. Don’t let the name deceive you; Denim Habit in Marlton goes way beyond their impressive inventory of jeans. It’s also our go-to shop for trendy cocktail dresses that are sure to turn heads, whether you’re headed to happy hour or a housewarming party. When tying the knot, the perfect ring is an essential finishing touch. Haddonfield’s McNelis and Sherry, Inc. knows the importance of creating a timeless and personal feel with their engagement rings and wedding bands. They offer a wide range of cuts and designers like David Yurman that will create the perfect finale to your fairy tale romance. When it comes to shiny stones, we make Billig Jewelers our first stop to shop, and with good reason. After all, this family-owned jeweler has earned their sparkling reputation largely because of their diamonds, all of which are handled by their certified graduate gemologist. Designs are custom-made in store, too, with a constantly rotating stock that means you’ll never stumble on the same thing twice. Stay on time in style with any one of the fine timepieces from Family Jewelers’ collection of designers. They sell an impressive collection of both automatic and quartz watches from names like Citizen, Gucci, Seiko and Tissot and the expert jewelers are always on call for repairs. We have stopped in to Jewelbilee in Moorestown for their tables of costume jewelry in the past, but their accessories are what have caught our eye this year. They stock their shelves with unique handbags, wallets, clutches—even kids gear. Check out their hair accessories, which are constantly rotated to match whatever styles are available in-store. Moorestown’s La Di Da is the ideal place to find items to complement your favorite outfits. With a wide line of jewelry (think Brighton, Pandora, Alexis Bittar and Viv & Ingrid) to suit any style and any season, you’ll look good no matter what the occasion. When we’re looking for the best fashion jewelry to tie our favorite outfits together from designers like Gottlieb and Sons and Henri Bar, we focus our sites on Morton and Rudolph. It’s one of the few spots in South Jersey where you can find Troll Beads, Italian Murano glass beads and eclectic sterling silver and 18 kt. gold charms that you arrange to suit your mood and style. 1900 Rt. BEST GIFTS FOR THE HOSTESS When it comes time to shop for the lady of the house, we turn to Mixellaneous. Patterned serving dishes and cooking utensils will customize any kitchen, while personal picture frames, scented candles and assorted home décor items may inspire you to make a purchase for yourself. The styles at Optique Boutique turn an everyday necessity into a fashion statement. That’s because they carry designer frames from Oakley, Alain Mikli, Jimmy Choo, Betsey Johnson and more. With that kind of selection, who needs contacts? The selection at Unique Interiors in Cherry Hill extends far beyond their armchairs and sofas, with modern and contemporary accessories that will liven up any décor. The 13,000-square-foot showroom boasts an impressive collection of window treatments, bar sets and stools, ottomans and tables that add a level of style and sophistication to your living space. The new location of kids’ store Ragamuffins, now on Route 70 in Cherry Hill, is where “style is born.” This means you’ll find an extensive selection of layettes, toddler wear and all your special occasion needs to make sure your child is always the best dressed. Picking out clothes for your teen can quickly become an exercise in futility if you don’t play your cards right. Alleviate the stress at Dare Boutique, where you’ll never go wrong with the fun and flirty—yet age-appropriate—fashions on the shelves from popular designers like Sherri Hill, Comfy KT and Tkees. Georgie Girl Boutique in Haddonfield stocks their store with a nice variety of clothing, but their lingerie is what really has people whispering. Cleo, Little Minx and In Bloom are just some of the bare essentials you’ll want to stock up on here. If you’re looking for some unique items for your pantry, we’ve found just the spot. In the Kitchen Cooking School is not just a place to learn your way around the stove, it also houses a tiny retail store full of gadgets, utensils and some of Chef Kathy Gold’s favorite items like gourmet chocolates and other handpicked ingredients. If you’re the type of person that needs a brand name attached to your fine jewelry, look no further than Bernie Robbins. At any time, you can find their cases lined with pieces from Ivanka Trump, John Hardy, Ippolita, Marco Bicego and other high-end names. Looking for something a little more unique? The store also carries their own collection to choose from. When we’re looking to spruce up our surroundings for a special occasion or celebration, we turn to the arrangements at Petals and Blooms in Marlton. Not only do they use the freshest flowers when creating their stellar arrangements, but the owners were trained at Longwood Gardens, so they not only know about the petals their pushing, they know how to make them look gorgeous. Not only can you escape daily to relax and practice yoga at five area locations with more than 125 classes a week, Dhyana Yoga also plans an annual retreat in the U.S. Virgin Islands, which consists of yoga twice a day and meals as a group, along with a variety of other activities such as snorkeling, sailing, and hiking. If you’re too busy to make it to the Haddonfield location, yoga instructors will come to you; traveling to your home or workplace for a private session. The personal trainers at Fusion make sure you keep up your workout routine—they’ll even check up on you via e-mail if you haven’t been to the studio in a while. Fusion’s unique philosophy of training ensures your development of cardiovascular health, muscular strength and flexibility, as well as relaxation. Make friends by training in a group or get your own personal coach in a variety of specialties—including golf, softball, and weight management, to name a few. Future Fitness is the gym with the lowest dropout rate in America for a reason—is it the 12 different lines of machinery? The nationally certified trainers? The 85 free group fitness classes a week? Or the free monthly medical monitoring? The gym also offers ballroom dancing, swim lessons, and a unique Arthritis Foundation exercise program. At Smart Bodies, there’s no hassle associated with contracts or memberships —and when you go in, you always have an appointment with a personal trainer, who devises an individualized workout plan just for you. That means you’re getting the best workout for your body, not some generic routine that doesn’t produce any results. They also offer unlimited use of the cardio room, plus spinning and boxing classes, and nutrition coaching so you not only get healthy, you stay healthy. Available seven days a week, the Zumba experience at Cherry Hill’s Artists in Motion is unlike any other. With motivating music, energized instructors and mood lighting, the dance-filled workouts target not only cardio, but legs and upper body as well to create a well-balanced exercise. Novices needn’t worry, they’ll even bring beginners along or tame the tempo for new mothers and active adults. Whether you’re getting ready for a prom or wedding, just getting a trim, or undergoing a major hair makeover, Lotus Salon’s owners bring a combined 30 years of experience in making clients look their best. As a bonus, they offer specialized hair consultations in which the knowledgeable staff give you advice on which of their many advanced hair treatments is right for you. When you make an appointment at Main Street Barber Shop, you’re guaranteeing yourself a barber with more than 20 years in the business—no matter who is holding the shears. Besides just haircuts, this modern barber shop with old-school ideals offers a straight-razor shave and a beard trim. You can also get a manicure and a wax—without your wife. Thriv offers a variety of hair coloring services, including single and double process color, highlights, hair polish, and corrective color. If you’re not sure what exactly suits you, a brief consultation will allow you to customize your treatment. Don’t forget to shop before you leave—Thriv carries numerous high-end products which will help you maintain your new look. Looking for an alternative to waxing every few weeks? Head over to Dharma Karma where you can get your brows threaded, a technique that removes entire rows of hair rather than one at a time. The results last longer than waxing (five to six weeks), and the procedure is pain-free and without side effects when performed by the experienced threaders on site. Women want to beam with beauty, but caking on tons of makeup is never a good look. Over at Martino Cartier, the expert makeup artists know this, which is why you’ll never feel like a clown getting ready for the circus. Opt to get the makeup airbrushed; it will hold up better and feels lighter on your face, creating a flawless look on your skin. Of all of the spa treatments offered at Toppers, it can be difficult to choose just one, but if we had to, we’ll go with The Classic Day service. This unbelievable package includes a Swedish massage, a five-step facial, haircut or style, manicure and pedicure, makeup application, and even a bite for lunch. Take some of the luxury home with an eye pillow, spa bath collection and aromatherapy candle. Ever wonder how far to hold the blow dryer from your hair? You’d know if you were a regular at the “Blow Dry Bar,” a section inside The Make-Up Bar where award-winning stylists offer blowouts based on your preference of straight, volume or tousled. There’s something magical about Rizzieri’s experienced nail technicians and you’ll feel the difference as they buff, soak and scrub with precision and purpose. The wide variety of OPI and Essie colors are great and so is the gel polish if you need that color to last longer. Treat yourself to one of their seasonal specials, like the mango or pumpkin spice pedicure; it’s an hour of bliss. At Haddonfield’s Mane Stop, there are a solid variety of facials that will stimulate and exfoliate your skin, and they cater to everything from improving tone to anti-aging techniques. They also understand each person’s skin is different, and so the staff will work with you to determine the best approach, whether you’re getting the acne-reducing clear complexion treatment or passing through for the abbreviated mini facial. The Gentleman’s Facial at Suede Salon and Spa is the manlier version of their signature facial, complete with a skin analysis in order to customize the treatment and the products they will use. After your skin is thoroughly cleansed, enjoy a hand and arm massage to sooth those overworked muscles. Let your friends laugh if they want, but you’ll both look and feel like a new man. Frazzled and in a hurry on your wedding day? Most brides are. Thankfully there’s The Little Touches, a family trio that specializes in everything from hair and makeup to accessories for the big day. They offer customized packages, trial services, as well as airbrushed sun-free tanning to get that extra glow in your white dress. And because you don’t want to be scurrying all over town, they’ll travel to your location to make the process a smooth one.